This isn’t like buying a suit off the rack; Indochino custom tailors every suit to your measurements, and lets you put your own spin on it too. If you don’t have time to take your measurements right this minute, you can check out now and submit your measurements later, which makes this a great gift idea. There are plenty of fun and colorful options available, as well as lots of business-minded suits that still look great. Choosing your lining is the most fun part of the process. There are dozens to pick from, ranging from staid to whimsical. How many vents do you want? It’s your suit, your choice. How do you want to keep your pants up? 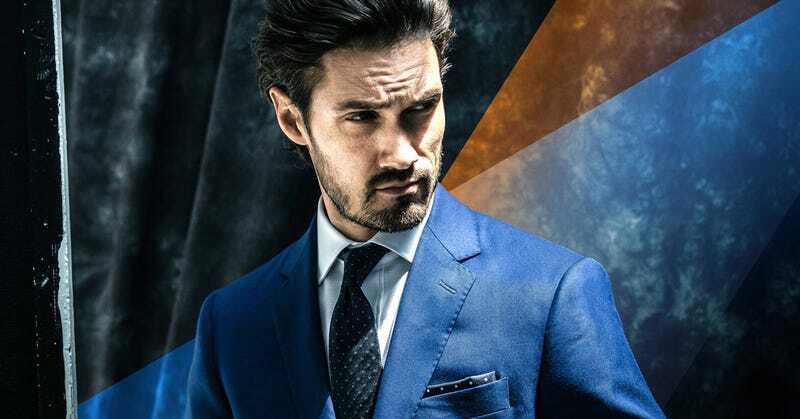 After you complete your purchase, you can go to your nearest Indochino showroom to get your measurements done for free, and they’ll add them to your order and start assembling your suit. If it needs any alterations when it arrives, just bring it in and they’ll fix it for free. Don’t have an Indochino store near you? Follow the directions on Indochino’s site to take your measurements at home, and submit them yourself. Once the suit arrives, if it doesn’t fit quite right, Indochino will provide directions for your local tailor, along with a $75 credit to cover their work. If for whatever reason you can’t get the suit to fit quite right, Indochino will remake your suit. Shipping and return shipping are free.